Optimise your local business website to attract more local customers. I audit your website & business profiles to see where you can improve. I fix Local SEO issues & implement new ways to boost your local search ranking. I track the results so you can see how your site is improving in the local map pack and organic search rankings. I then use this information to see whether your Google My Business Profile, citations, social media accounts, website and landing pages contain errors or inconsistencies that may be stopping your business from ranking higher. Your Google My Business (GMB) profile is a major factor in determining how Google ranks your business in local map pack and organic rankings. I can find issues with duplicate GMB listings, incorrect name, address, phone (NAP) information, incorrect business category and more. Fixing GMB errors can give your business a big Local SEO boost. A business citation is a listing of your business’s name, address and phone number (NAP) information on a website or business directory such as Yelp or Yellow Pages. Missing, duplicate, or incorrect business citations can cause your Google search ranking to drop significantly. I find and check your current citations for inconsistencies and errors. As an extra service I can also provide citation building and aggregator submission to get your business listed on the most important directories and websites in your industry. Ensuring your website is optimised for Local SEO is a sure-fire way to boost your organic search rankings. I check to see whether your website structure is implemented according to recommended best practices. This can include checking for the correct permalink structure and layout of your categories, services, business locations, homepage, blog section etc. Landing pages with thin content, no content, or duplicate content will have a negative effect on your Local SEO rankings. I look to see whether your landing page content is unique and created with well-defined keywords in mind. Are all your website pages showing in the search results? I check to see whether the right pages are correctly indexed and check deindexed pages for Google penalties and technical issues that might be stopping customers from finding your business. Page metadata and alt text are important organic ranking factors. I look for missing alt text and metadata and investigate whether the existing alt text and metadata are optimised for your page’s keywords. Schema helps inform search engines about your business’s NAP details, services, locations, opening times and more. I check for missing and incorrect business schema which could be stopping your website ranking as high as it should. Google Analytics is a free tool that is indispensable in enabling you to track your traffic and customer acquisition process. I check to make sure you are using the latest analytics code and that your analytics dashboard is set-up correctly. I check the top review sites so you can see what your customers think about your business. Search engines like Google and Bing use your reviews scores and testimonials to influence your search engine ranking so monitoring your scores is an important to protect your business’s reputation. I check your how your top keywords are performing in a specific town or city so you can how your business is ranking in a location of your choosing. Search engines use the location data of your customers when they search for your services so it is important to monitor your business at a local rather than national level if you are a local business or tradesman. Local SEO involves optimising your site to rank more highly in search engine results relevant to a customer’s location. This useful when you are a local tradesman, local business or offer a local service and want to target potential customers nearby rather than nationally or internationally. The search engine results pages on Google and Bing often display a mixture of local map pack and local organic results. Local SEO helps you optimise your website and Google My Business (GMB) profile in order to rank above your competitors in these results so that people are more likely to find your business before they find your competitors. Do you provide Local SEO for service area businesses (SAB) as well as brick and mortar locations? Yes, I provide Local SEO services for service area businesses as well. SABs such as tradesmen and local businesses without a publicly accessible shop front must be optimised differently from shops and brick and mortar establishments. If your SAB website and GMB profile is not set-up correctly you risk being penalised by Google and your business not appearing in search engines at all! What is the difference between local map pack results and local organic results? The local map pack displays when a user makes a search that has a local intent such as “coffee shops near me”. 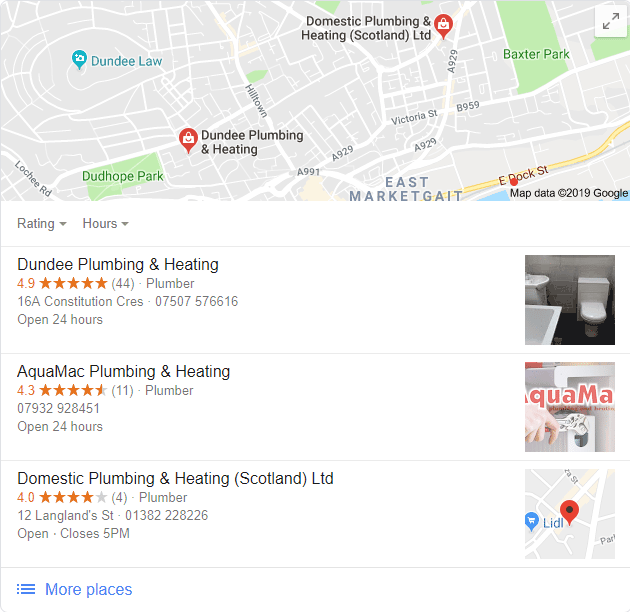 The search results page will contain a prominent card showing the top 3 results, their customer reviews and large links to their website as well as their locations on a map. Competition for these top 3 map pack spots is understandably fierce as they often get the most clicks from potential customers. Underneath the map pack are the usual local organic results. Getting to the top of the map pack and the organic results will mean having your business listed twice on the top of the first page of Google. This will increase the traffic to your website, calls to your business and visits to your store locations. 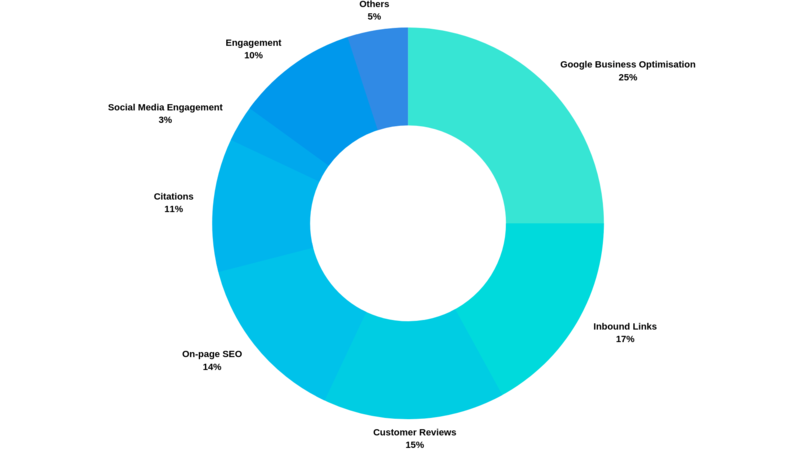 What are the biggest factors that influence Local SEO rankings? There are a number of factors that influence your business’s Local SEO ranking and it can differ depending on whether you are targeting the local map pack or organic results. 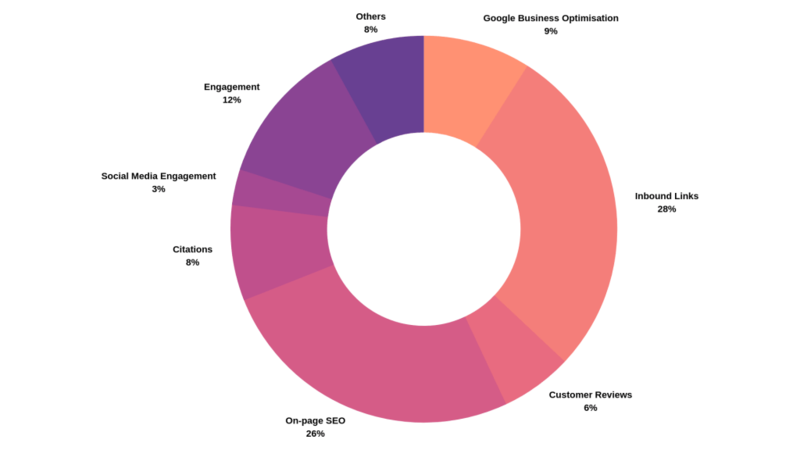 Check out the charts below to see what the major ranking factors are for Google search. As you can see, an accurate and well optimised Google My Business (GMB) profile is critical in ensuring you display in the map pack. While your GMB profile is still an important factor, local organic results depend more on inbound links and good on-page SEO optimisation. NAP stands for Name, Address & Phone Number. 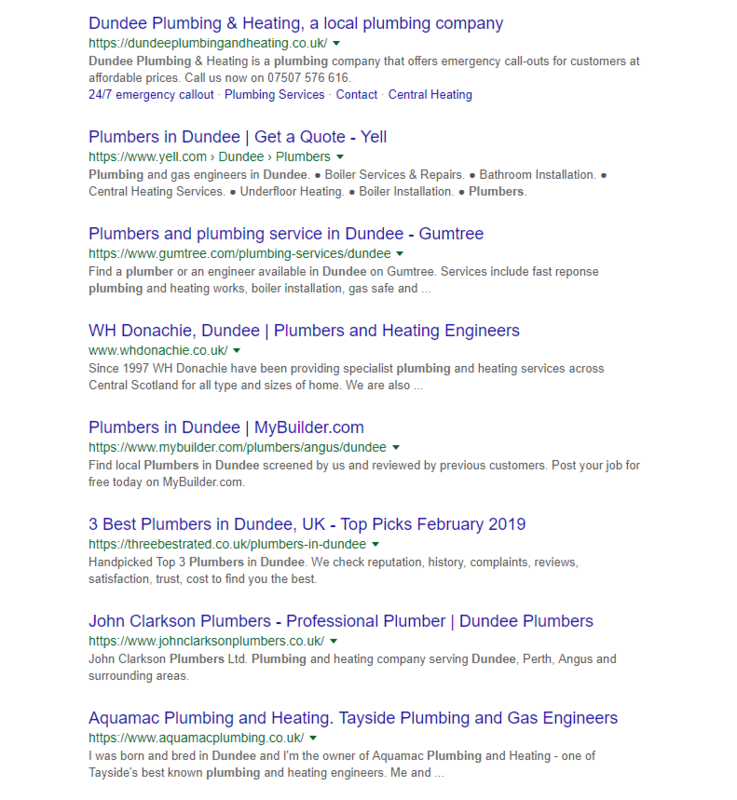 When creating business citations and optimising your GMB profile it is important that your NAP is consistent with the information on your website. It is also important that the NAP information is correctly marked up with schema to ensure that your website is ranking as highly as possible.